Dehai News -- Candlelight Vigil for Rapper Nipsey Hussle at the Eritrean Community Center of Georgia. ATLANTA (FOX 5 Atlanta) - Hundreds turned out Tuesday night at a Stop the Violence prayer vigil at Morris Brown College in Atlanta for slain Los Angeles rapper Nipsey Hussle. Rap Artist Killer Mike had a powerful message of self-love and anti-violence among the black community. “Brothers we gotta stop killing each other and making it easier for the enemy to divide us,” Killer Mike told the crowd gathers ales at the college. It was a poignant message after the West Coast murder of rapper Nipsey Hussle. “He was a member of a street fraternity, he graduated out of that street fraternity, turned into a legitimate businessman. He was a person that was returning the black dollar in our community, it was just a shame his life was cut short,” said Killer Mike, whose real name is Michael Render. The candlelight vigil was sponsored by Morris Brown College, still in existence despite recent financial troubles. Killer Mike, who is on the advisory board, came up with the idea of a peace rally to draw attention to the enduring energy of the college and a call to stop the violence after the slaying of Nipsey Hussle in Los Angeles. “The greater message is we can disagree but at the same time we don’t have to use violence when we are going through our disagreements and so we really want everybody out here to promote peace and unity and come together as one,” said Dr. Kevin James, the interim president of Morris Brown College. 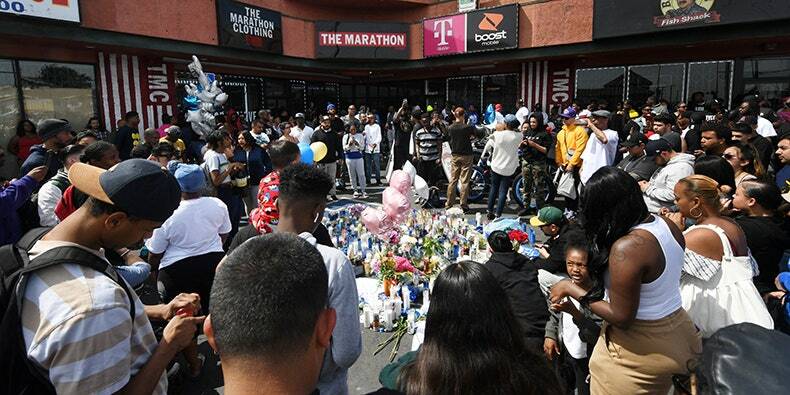 It was a fate not afforded Nipsey Hussle who may be from L.A. but whose music and humanitarian efforts in helping his community had ripple effects all the way to Atlanta. “As opposed to us shooting and getting within violence he would want us to come together he wouldn’t want us to act the violence to show the community even more,” said Troi Thuercay, a student at Georgia State University. Many of the people who attended the candlelight prayer vigil were African-American college students who said Nipsey Hussle was a role model they could follow. Just a few miles away, hundreds of people gathered at in Stone Mountain to honor the Grammy-nominated rapper. Fans and members of the Eritrean Community Center of Georgia paid their respects at their own candlelight vigil. Those who attended the event said moments like this will show the community the meaning of togetherness and why they need to unite. Fans said his loss is not only a loss for the community but for the entire music industry.